This Gallery shows the personal interpretations of our knitters. Each person puts a little bit of themselves in the finished product. 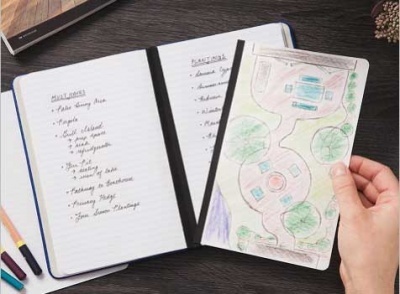 If you'd like your creation included, please let us know via the contact us page. Also, be sure to check out our Ravelry group. Caryl had her own vision of what she wanted as her Moonrise Necklace. 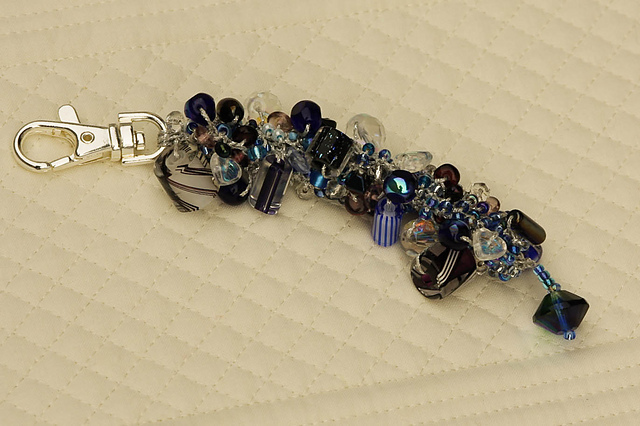 She worked with me on what colors she wanted for the beads and after a bit of back and forth we came up with the perfect mix. Tah dah! Then she created this beauty. 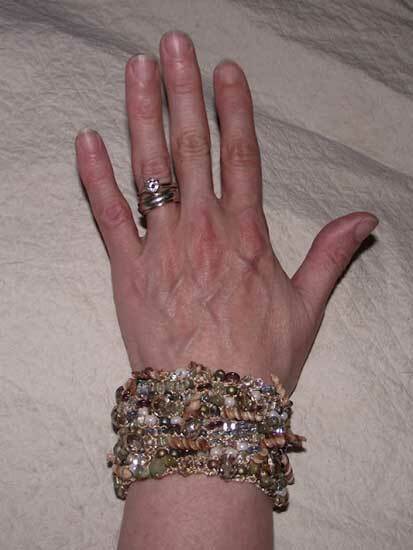 Carol wrote to me, "I got the pattern this morning, finished this afternoon, wearing it this evening. I love it!" A beautiful piece. Oh yes! 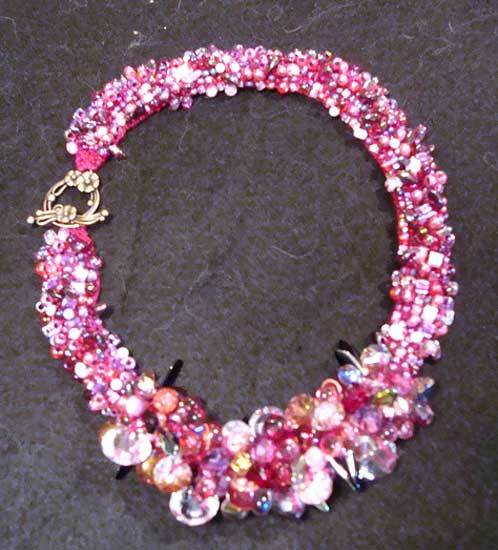 MarGee has created her first necklace, a beautiful version of the Moonrise on Neptune Necklace, done in the Magenta colorway. Wow! Wow! 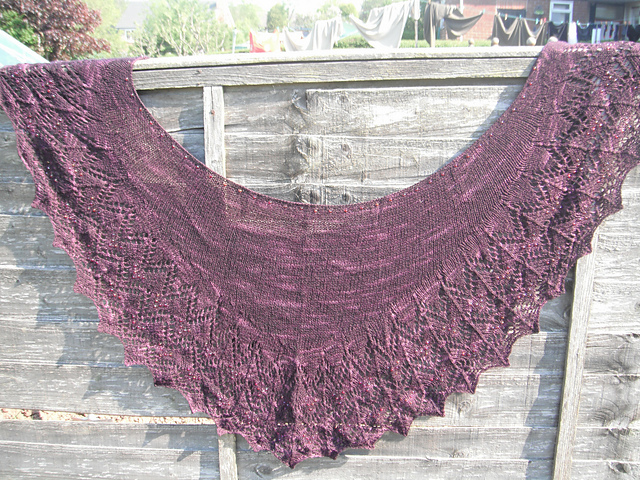 Take a look at the Oborine Shawl that Bobbie made. 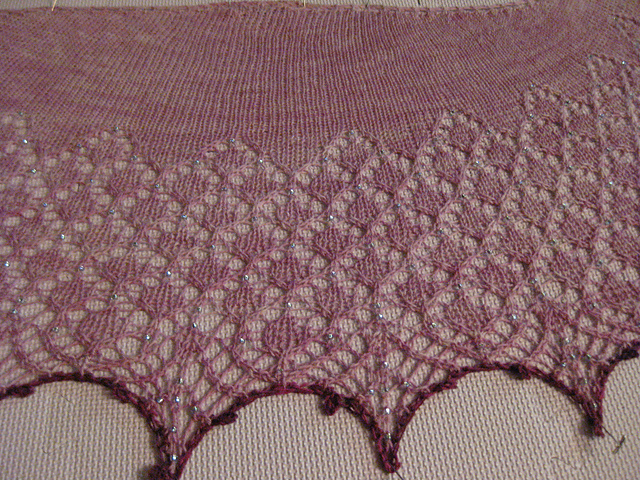 This is with the Rosebud colorway of Dreamy. Gorgeous! Didn't Jan make a beauty? Wow. Lovely. Pochan has created a most lovely Mitered Obsession Cowl. Really a beautiful piece! 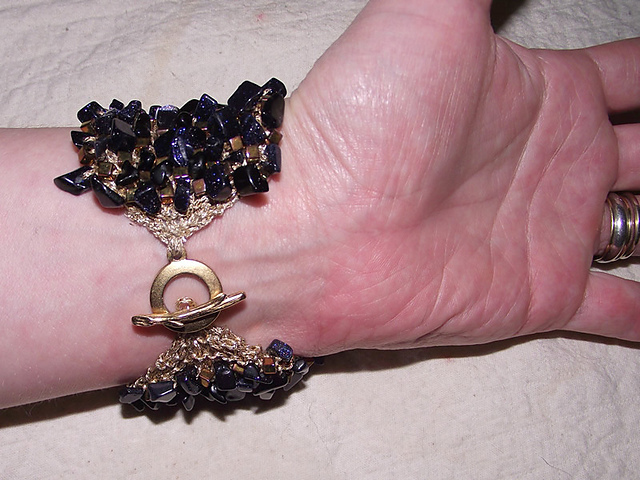 Julia made a simply gorgeous Raven Bracelet! Deep, dark, mysteriously beautiful. 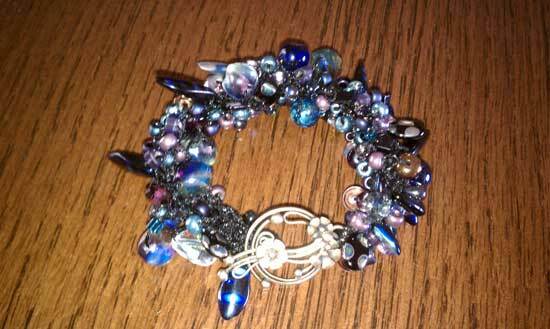 Vicki made a gorgeous Northern Lights bracelet, using black thread in stead of silver. Quite dramatic, don't you think? Look at the gorgeous piece that ckwquilt made: I think it is truly awesome. She used the Alberta Moss kit. Wow! 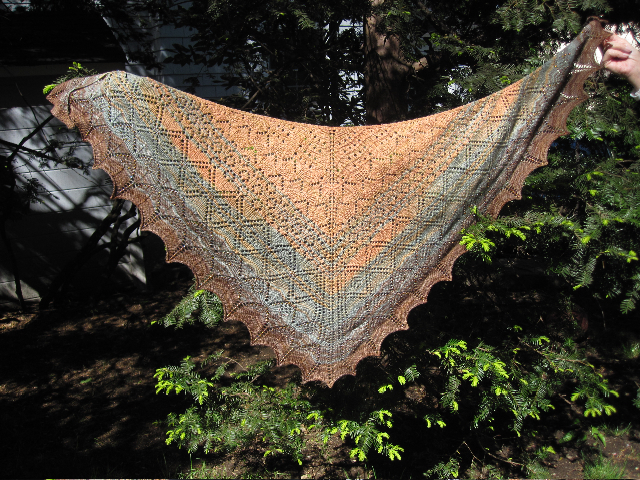 Bobbie Bruess did a gorgeous version of the Renaissance Shawl. Simply stunning! 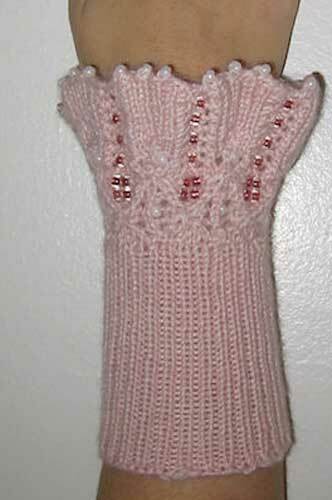 Here are the Maia Mitts pattern by Romi -- these were knit by Bernadette Wells who added her own modifications to the piece. Gorgeous! 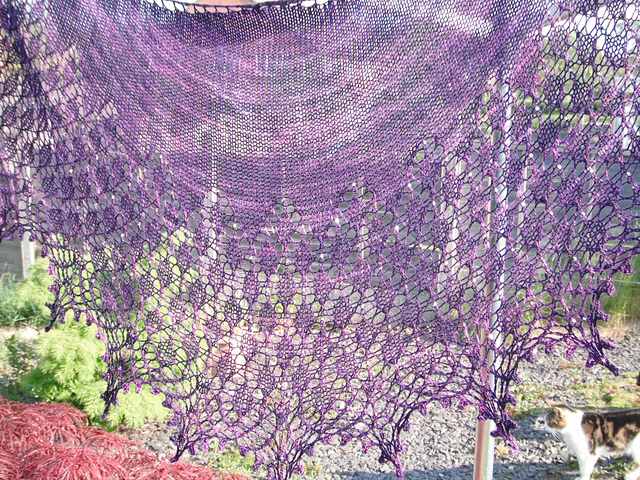 Bobbie made a gorgeous version of Lily Go's design, using Ella Rae Lace Merino in a rich royal purple. 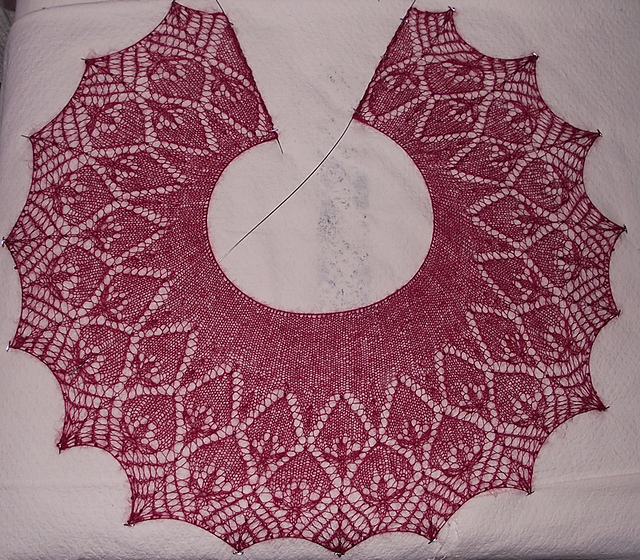 From the needles of Joan, done in the delicious Glimmer, comes this version of Abbey Phelps' Siolau. Wonderful! Bobbi made a glorious rendition of the Pasg Scarf. Really lovely! A lovely version of Susanna IC's Annis, the beaded version that we carry, using the stunning Gradiance set of Old Rock Wall. Gorgeous! 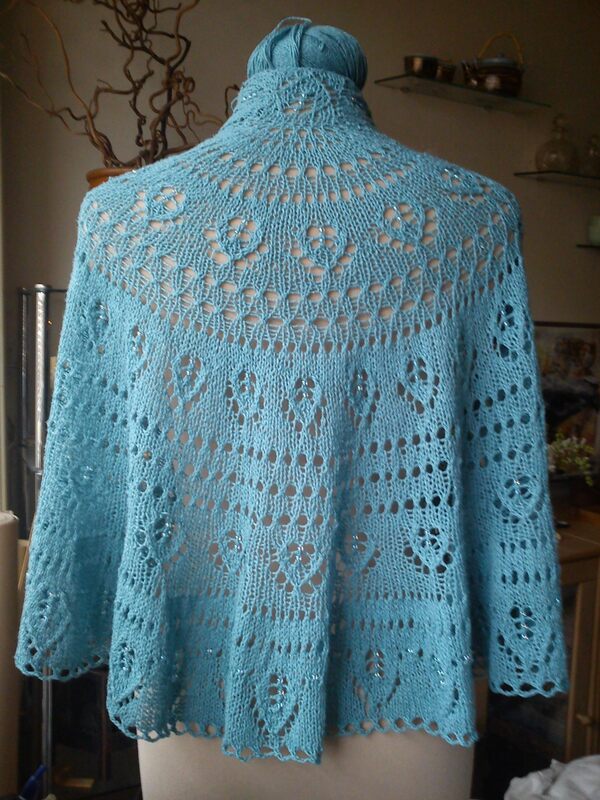 Meg knit the lovely Newfoundland Shawl, by Anne-Lise, using two skeins of Pura Bella's wool/silk lace weight. She put two beads, one on top of the other at the YOs instead of nupps. Lovely! 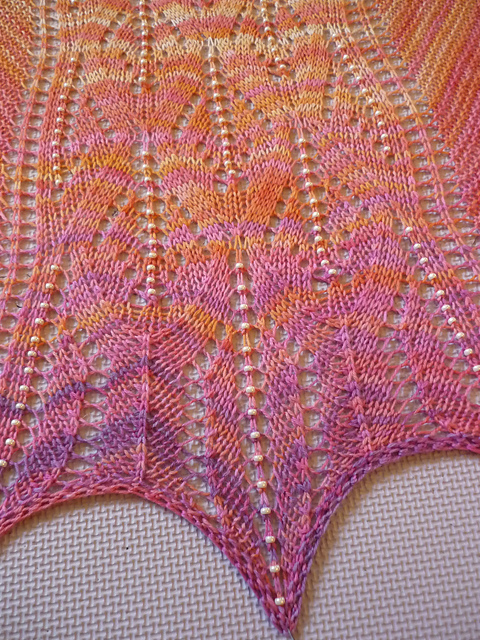 Christina knit the lovely beaded Watership Down (design by Janine LaCras) using one of our exclusive Gradiance colorways. This one is called Thunderhead. Stunning! Joan did a stunning version of Tori's Bubbles & Beads. 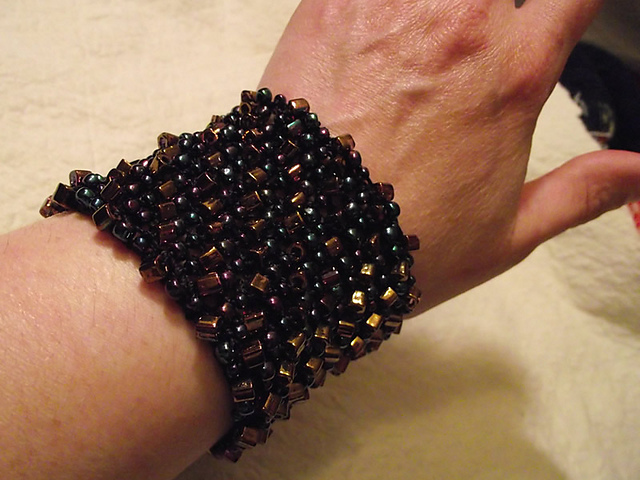 She added an extra repeat and used some more beads. The result is wonderful! 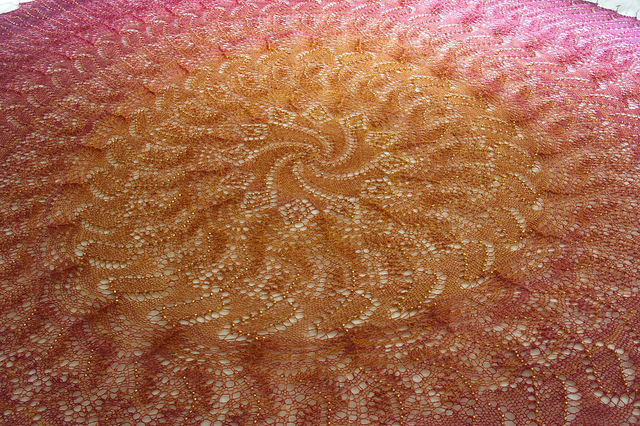 A really beautiful design, here is the Peacock colorway as knit by Jette. 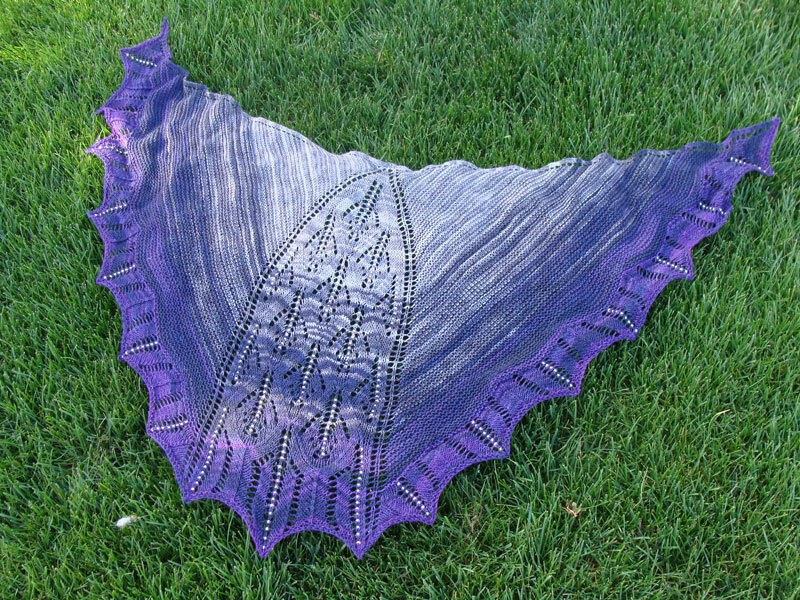 What an awesome shawl she has created! 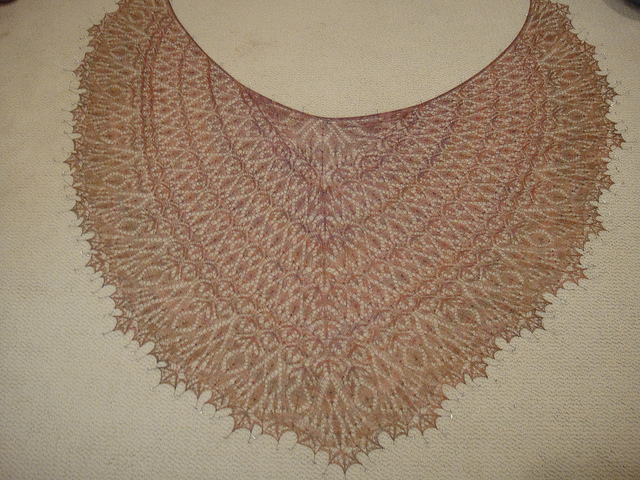 Nicky did a really stunning rendition of the Newfoundland shawl using Taiyo Sock yarn. Yum! 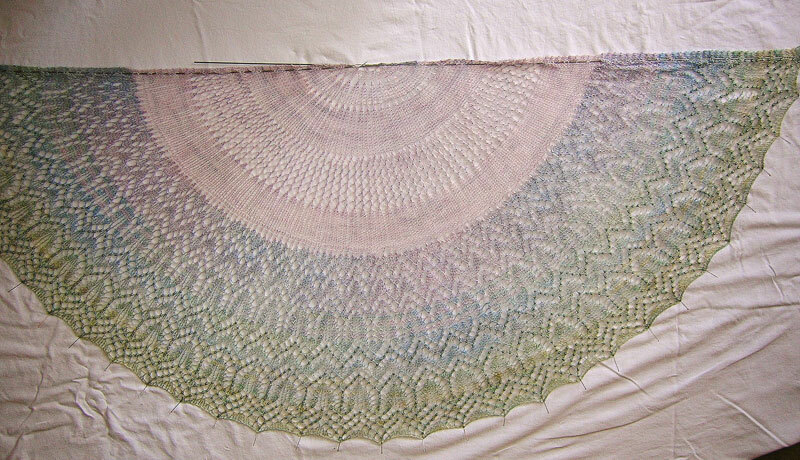 Stéphanie did a stunning version of Treasure Island using one of our special colorways from TUS. She chose Roi Soleil. What a gorgeous piece! 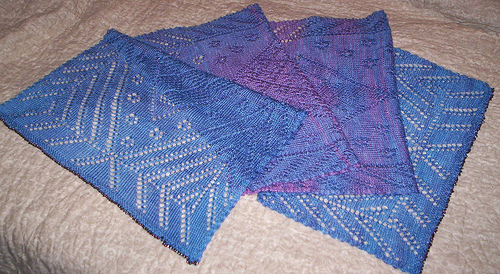 Jette knit two marvelous renditions of Heidi Barrett's Saturn's Embrace. 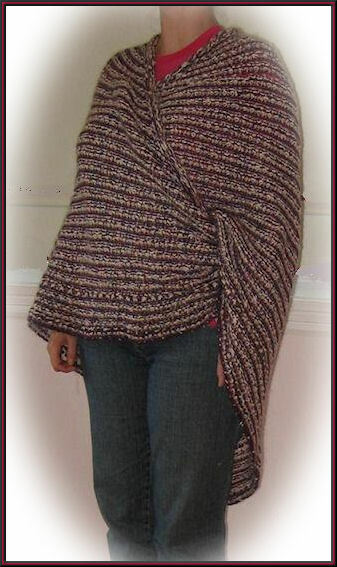 Her colors are very close to Heidi's originals -- and the shawls look fantastic! What a lovely piece Jennifer made! She was given this kit as a Mother's Day gift and send us the photo just two days later. Gorgeous! 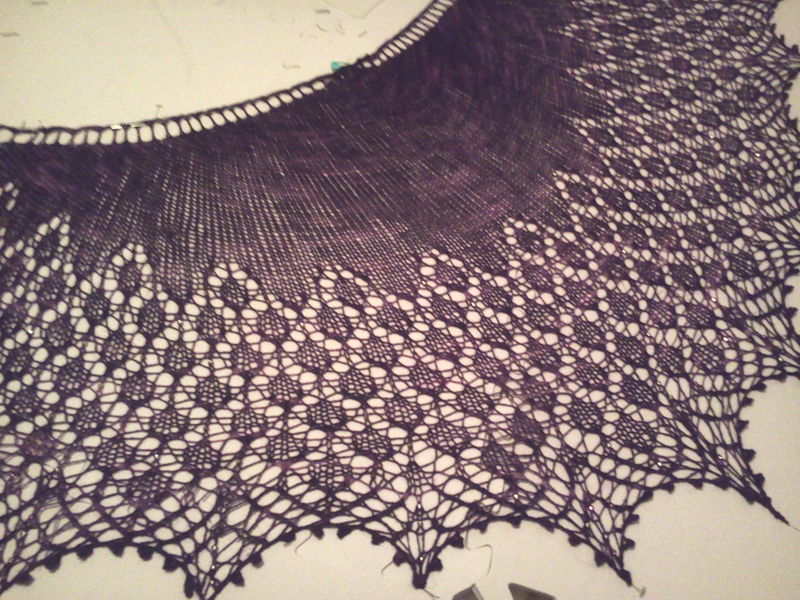 Look how lovely Joan's shawl came out, knit in a yarn with long color repeats! 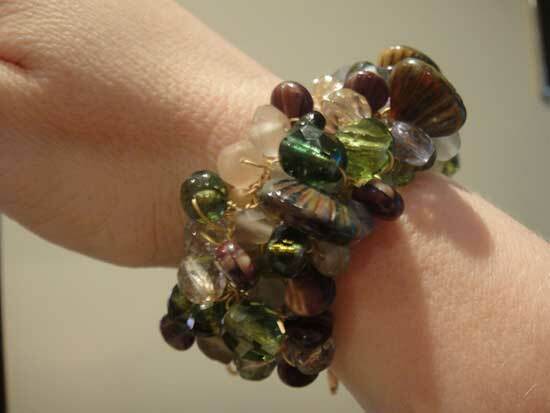 Here are Jennifer's beautiful versions of our Bead Stew Bracelets -- specifically the Twilight and Deep Forest ones. She made gorgeous pieces! And people keep coming up to her to ask for the bracelets for themselves! Karin created a beautiful cape, loosely based on Sivia Harding's Inkberry, but with a lovely beaded leaf from a Danish pattern. 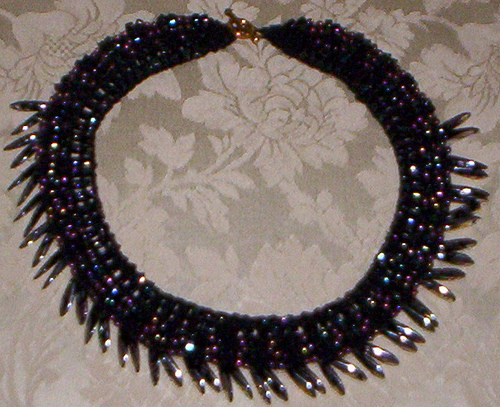 By Linnea, a really lovely version of the Moonrise necklace, in the bead mix we call Rock Candy! 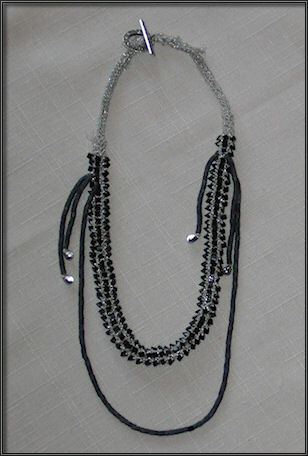 A stunning rendition by Joan, using Freia lace weight in Denim and adding wonderful sparkling beads along the bottom. Wow! 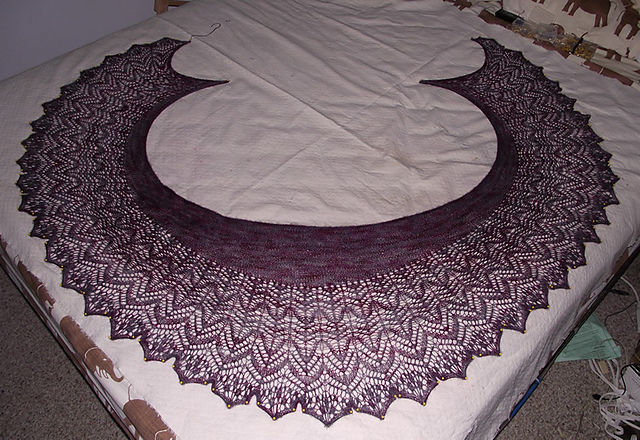 Verna (aka SharraOfSunhaven on Ravelry) has created an absolutely amazing piece! 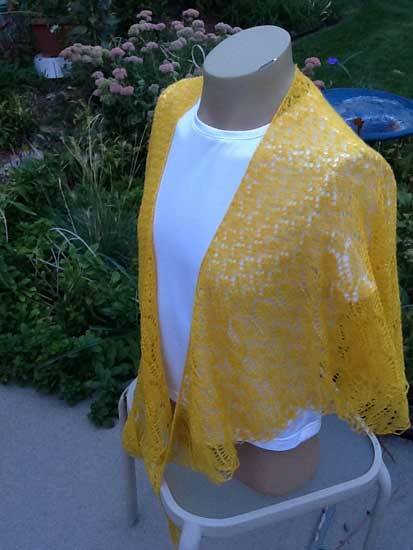 She knit it using Marici Lace dyed in our special Dragon Fire gradiance. 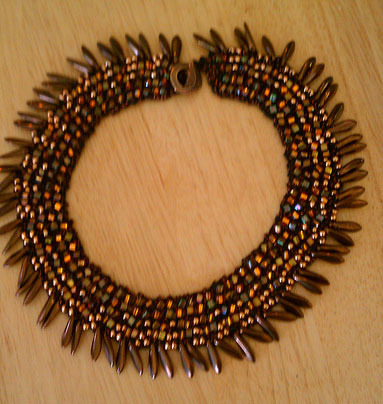 And embellished with beautiful beads as well. 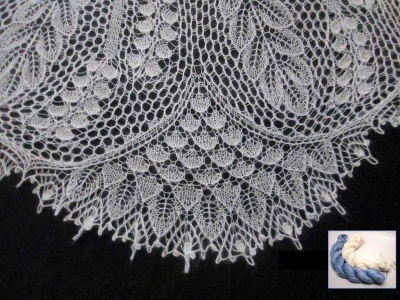 From Joan, knit in a lace weight. Simply lovely! Joan's gorgeous creation -- she writes: "Really yummy! ... finally a Noro yarn that doesn't make people itch from across the room!" 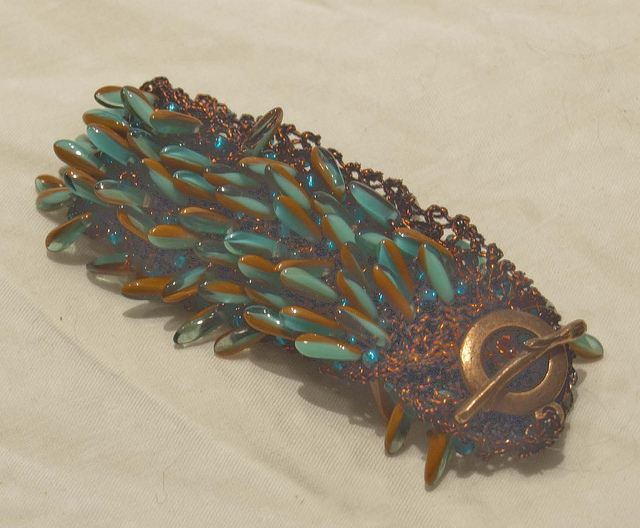 Verna made this using the Perseus daggers -- and we worked with her to create it as a perfect match for her Cool Waters shawl! 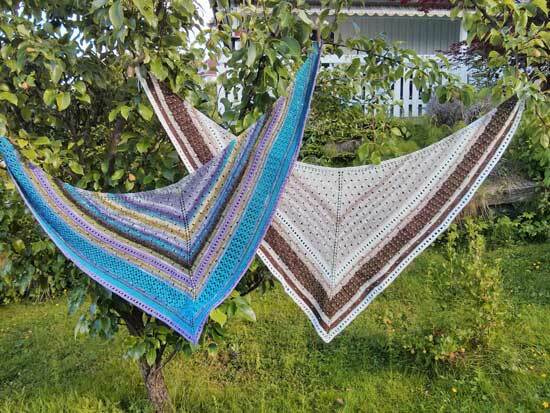 A lovely pair made by Joy, using Canopy yarn and beads we selected together. Danielle's stunning rendition of our California Dreaming. Ooomph! 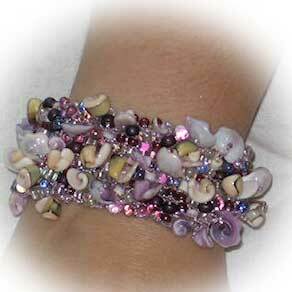 By Miriam, made in loving memory of her godmother who taught her the joys of shell collecting. Gorgeous! 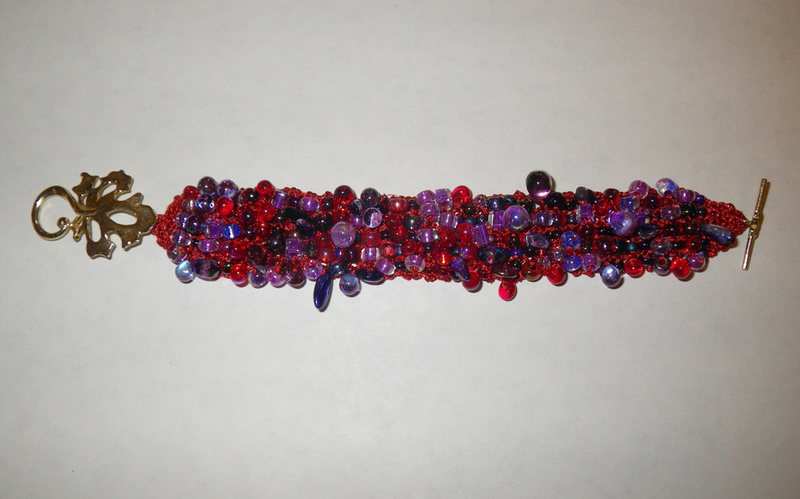 Kathryn is making a set of beautiful bracelets for the attendants at her daughter's wedding -- all in peacock colors! Gorgeous indeed! Cynthia made a true beauty! 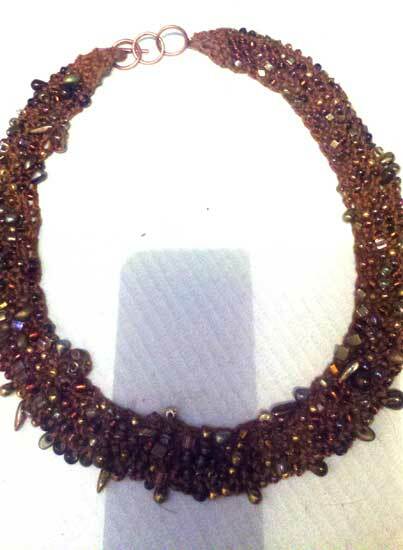 Using Tosh Lace, 8/0 beads and her amazing knitting skills -- she turned this pattern into something truly awesome. Cynthia's beauty! 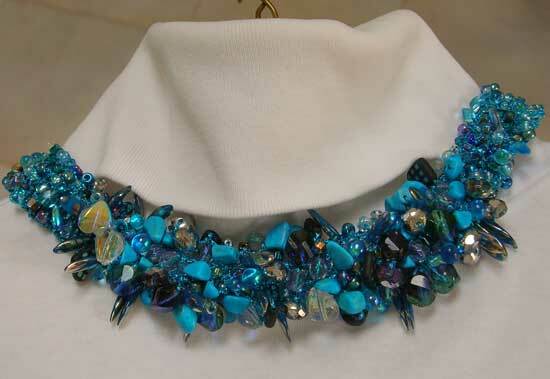 She kept the clasp behind the neck and really showcased the beads. Gorgeous! Another beauty by Joy -- such a marvelous look! A lovely version by Joy -- we worked together to match colors for a special dress. Pretty awesome, don't you agree? This is another beauty from Miriam, that was a custom version of Dragon Memories. We worked together to find beads to fit her vision and the result is stunning indeed! MRPP's version of the Blue Goldstone River Bed. Lovely! 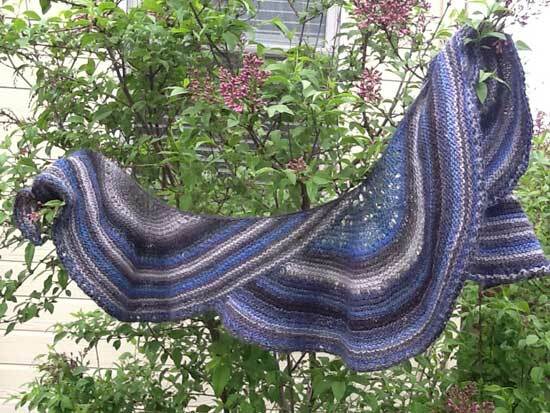 MRPP has taken inspiration from Basilica as well as a number of other shawl patterns and created her own masterpiece, using Tosh Lace in the colorway called Black Velvet. Gorgeous! 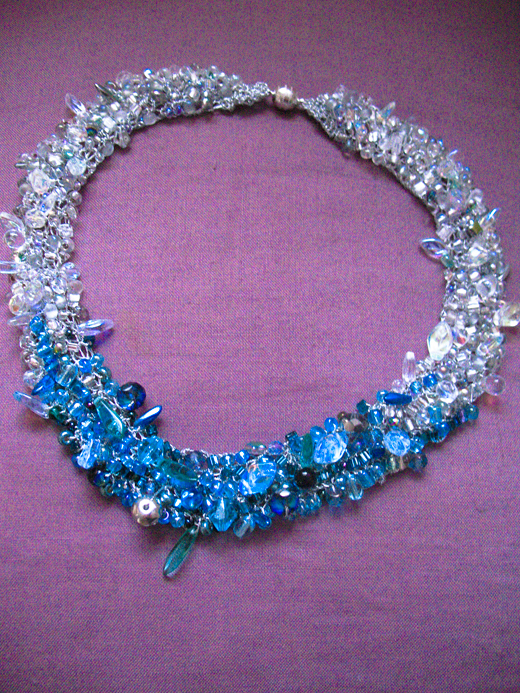 A marvelous version by Patrice of the stunning Crown Jewels necklace! It is amazing how each version is unique unto itself. Stunning! Patrice made this as a gift for a friend who has a new Harley, all cherry red and chrome. Came out wonderfully! A lovely rendition by Patrice! 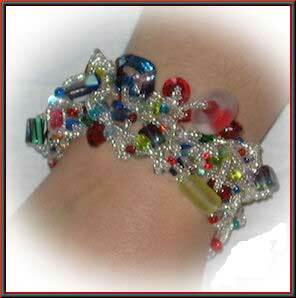 A fun bracelet by Romi, this is Joy's interpretation with a little help from our beads. Glowing and quite something indeed! 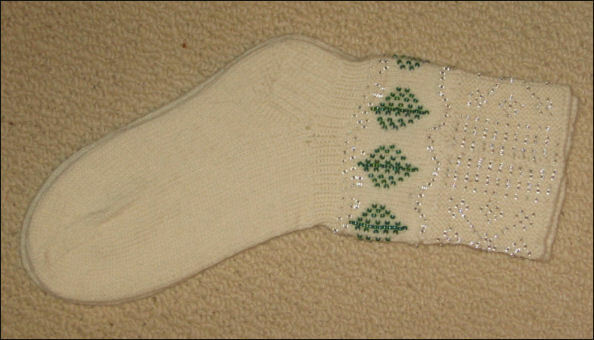 This is based on a sock pattern by Jackie E-S -- such fun! And Joy did a wonderful job with these. Joy made a stunning version of this one -- she asked for silver thread, beads and clasp instead of gold based ones and this is the result! Beautiful. A Jackie E-S pattern, as interpreted by Joy, using leftover yarns. Lovely! Sue made one in the garnet colorway. Like a flower garden. Look what a beautiful piece Brandy made! 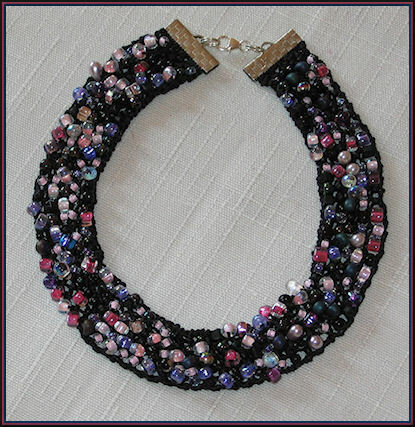 A wonderful beaded version of her Annis pattern by Susanna IC, as created by Denise. Lovely! A lovely rendition by Denise! As created by Joss, with his own special touch. Elisabeth made a stunning version of this. By Jackie -- look at it glow! Beautiful. As created by Anne -- stunning! 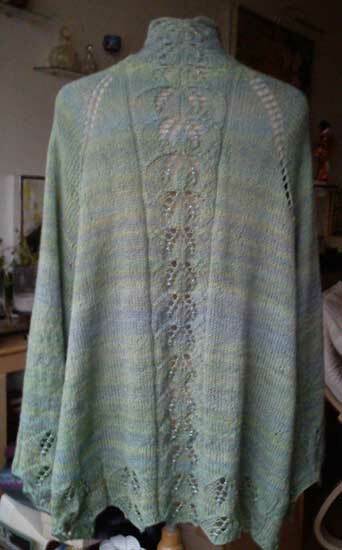 Gorgeous version by Miriam -- knit with Pura Bella mohair/silk. Wow. 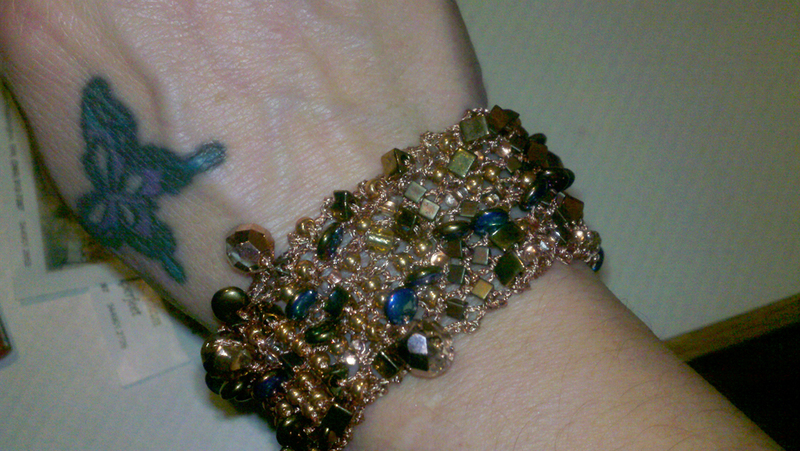 By Danielle, a most lovely creation, made using Rock Candy Mountain in Ling. This version by Joss -- I am in awe -- in our Dragon's Dawn. OMG! Joss did it again! A stunning version of Firelights (by Mary White), in Windy Sea gradiance. 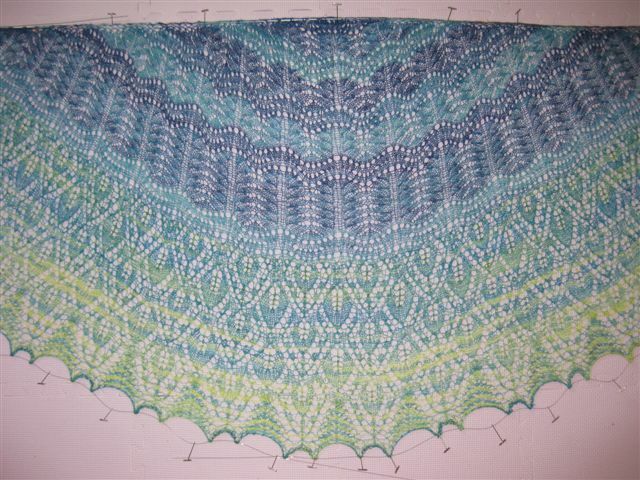 As knit by Bobbi Ann, in Dragon's Dawn gradiance -- wow! 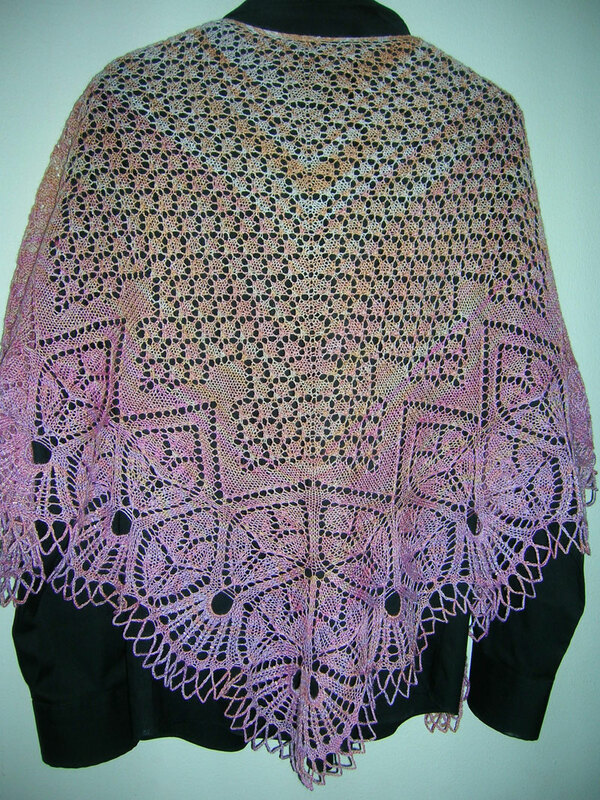 Rachel made this using Mardi Gras gradiance and the beautiful shawl pattern by Chrissy. 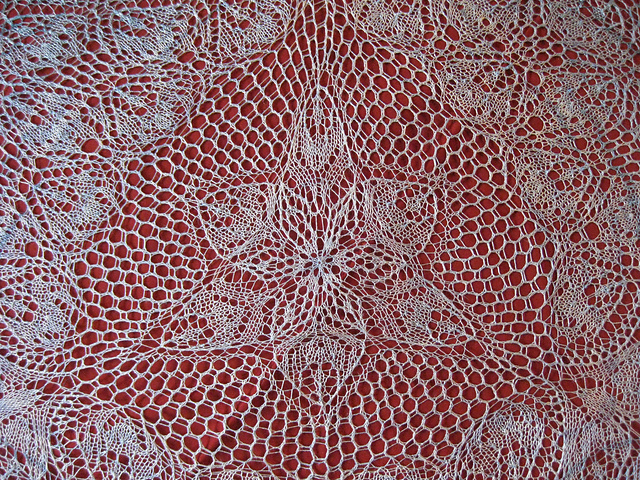 Luanne's creation in Pura Bella Wool/Silk Lace Weight -- gorgeous! Amazing version by Verna -- oooh la la! -- in Neptune's Garden gradiance. 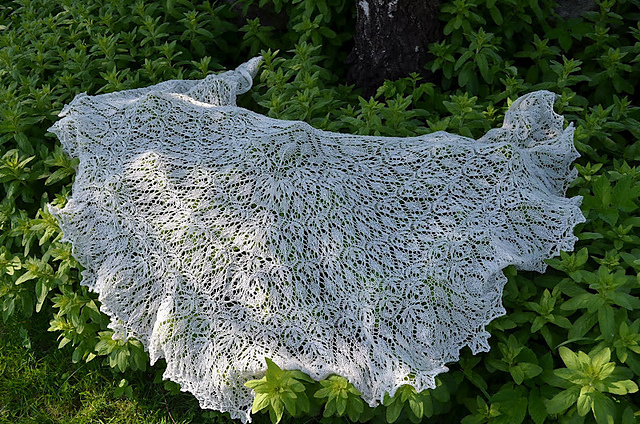 A simple piece, made with luxurious yarn -- this creation by Jossroll and lovely! 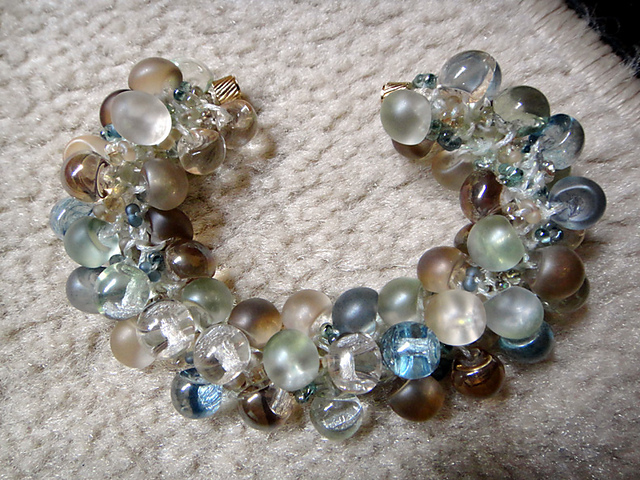 A beautiful creation, by Jette, made using Snow Glint in Eos and silver lined crystal beads. Done in the Gradiance called Dragon's Dawn. By Cynthia C.
By Anita K, using one of our exclusive gradiance colorways, Van Gogh's Sunflowers. Suns and Stars. By Lauris W.
By KnitaStitch. Done using a Gradiance colorway from The Unique Sheep. In Ling yarn by Cynthia C.
Also called Raspberry Frappe Wrap created by Cynthia C.
Blue version created by Joy C.
This article was published on Friday 15 January, 2016.